Myrmica rubra Linnaeus, often called the European fire or red ant, is an adventive species found mainly in the northeastern United States. It was first discovered in Massachusetts in 1908 by Wheeler (1908). This stinging ant species is considered to be a potential health and ecological risk to the U.S. The first reports of red ants stinging people in Maine occurred from the late 1960s to the mid-1970s, but it was not until 1986 that the species was confirmed as Myrmica rubra. Complaints received by the University of Maine Cooperative Extension office have increased sharply since 1998 (Groden et al. 2005). Today Myrmica rubra is considered a nuisance pest in most places where it is established in North America. Figure 1. Adult worker of the European fire ant, Myrmica rubra Linnaeus. Notice the sting, the two-segmented waist and the two spines on the propodeum. Photograph by E. Groden, University of Maine. 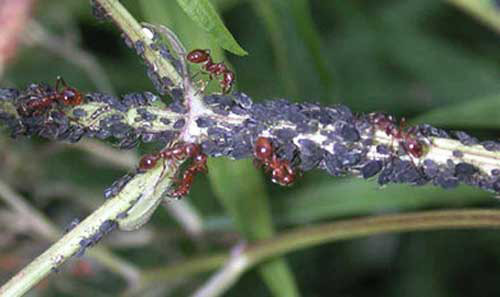 However, in Europe and northern Asia, where these ants are native, ants in the genus Myrmica are considered important for the conservation of rare Maculinea butterflies that live in association with the ants. Myrmica rubra in particular is considered to be a host for Maculinea teleius, Maculinea nausithous, and two cryptic species of Maculinea alcon (Elmes et al. 1998). These butterflies are an important research topic due to their social-parasitic relationship with Myrmica ants and their importance as bioindicators of the health of Paleartic, and moist-grassland ecosystems in Europe (Mouquet et al. 2005). Myrmica rubra is native to the Palearctic regions of Europe and Asia from Ireland to western Siberia (Czechowski et al. 2000). In the Old World, Myrmica rubra is found from 25° latitude north to the Arctic Circle (66°N) (Elmes et al. 1999). 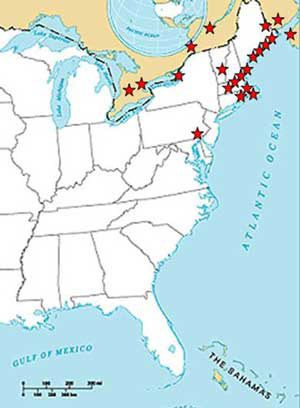 Based on its native distribution, the potential invasive range of Myrmica rubra in North America would span the southern-most inland part of Florida to the north of Hudson Bay in Canada. In North America, Myrmica rubra has been reported in Maine, Massachusetts, New York, Pennsylvania, New Jersey, Washington D. C., Rhode Island, and New Hampshire in the US, and in Ontario, Québec, New Brunswick, and Nova Scotia in Canada (Groden et al. 2005). Since 2001, entomologists at the University of Maine have conducted periodic surveys to determine the movement of and the area colonized by the ant. In Maine, the ant is restricted to humid places along the coast. However, colonies have been reported at inland locations and there is a concern that the ant is capable of establishing in these new areas. Figure 2. Distribution of the European fire ant, Myrmica rubra Linnaeus, in the Unites States and Canada. This information is based on the published literature and surveys conducted between 2002 and 2004. Illustration by H. Alejandro Arevalo, University of Maine. Myrmica rubra is a Myrmicine ant, one of 116 species recorded in this genus. There are several species of Myrmica in North America. Among the most commonly reported are Myrmica detritinodis, Myrmica incompleta, Myrmica emeryana, Myrmica brevinodis, Myrmica americana, Myrmica fracticornus, and Myrmica evaneda, which makes the morphological identification of Myrmica rubra complicated. Some of these species are not very common in the northeastern United States and most are rarely found in disturbed areas, which help us to recognize Myrmica rubra in the field. 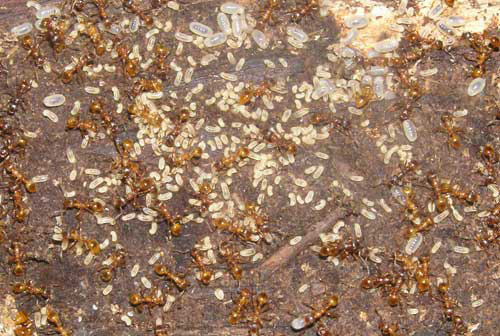 Workers of Myrmica rubra are of a reddish-brown color, but the coloration greatly varies between individuals and colonies. Workers are small (4 to 5 mm), their waist has two segments, the head and the mesosoma are heavily sculpted, but the abdomen is shiny. The worker's body is cover with fine hairs. The antennae are 12-segmented with a four-segmented club and a bent scape. The propodeum (the first abdominal segment fused anteriorly to the thorax) has two spines pointing backwards, which is one of the main differences from other native ants (not of the genus Myrmica) in the northeastern U.S. There are a few morphological differences that help to differentiate Myrmica rubra from the other ants within the same genus. 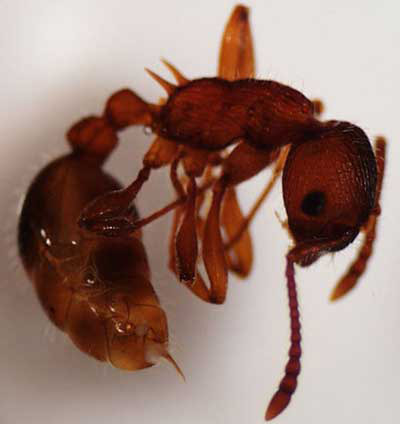 When viewed dorsally, the frontal lobes of Myrmica rubra look thin and lamellar, laterally developed and do not cover the antennal base, and the propodeal lobes form a 90° angle apically (Francoeur, unpublished data). Figure 3. 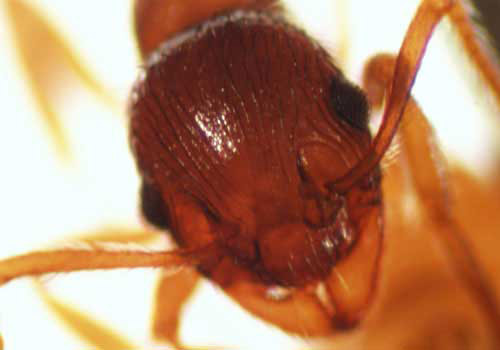 Detail of the head of an adult worker of the European fire ant, Myrmica rubra Linnaeus. Notice the bent scape, the frontal lobes with respect to the base of the antenna, and the sculptured head. Photograph by E. Groden, University of Maine. In North America, Myrmica rubra nests are cryptic and difficult to spot at first glance, as they do not construct obvious mounds from soil. Nests are usually in places that maintain high humidity for the colony including in the soil along roots of trees or shrubs, under rocks, logs or other human or natural debris, and in decaying logs. Their nest densities are extremely high in infested areas in the U.S., averaging between 0.5 and 1.5 nests per square meter, compared with 0.02 to 0.3 nests per square meter in their native habitat in England (Groden et al. 2005). The life cycle in the United States is still being studied. Myrmica rubra is polygynous (many queens per colony) and polydomous (many nests per individual colony). This situation allows Myrmica rubra to maintain very high densities of individuals and nests in some areas. Myrmica rubra colonies are also extremely mobile and some colonies move their nests regularly throughout the summer. In Europe, nuptial flights occur during mid-August to mid-September depending on the latitude. Queens overwinter before laying eggs for the first time. Some queens overwinter alone, others as groups of newly mated queens, and some join an existing colony. In the following spring, queens search for food to begin reproduction. Queens that are part of a group have an advantage in foraging for food, and these queens will usually experience higher survival than solitary queens. From egg hatch to egg production, queens take at least two years to start a colony. In Europe, Myrmica rubra produces two types of brood characterized by the time necessary to mature. Rapid brood develops in the year that it is laid, but a slower brood will overwinter as third instar larvae and mature to adulthood the following year (Elmes et al.1998, Elmes et al. 1999). Figure 4. Workers of the European fire ant, Myrmica rubra Linnaeus, gathering and protecting various larval instars after the nest was disturbed. Photograph by H.A. Arevalo, University of Maine. In the United States, the situation is different. No nuptial flights have been reported, and new infestations appear to be caused by human-aided dispersal, particularly with the movement of infested soil, mulch, and potted plants. Colonies that are already established spread to adjacent areas via budding. This occurs when one or more queens and a group of workers, frequently with brood, move from an existing colony to a new nest site to form a satellite colony. Maine populations overwinter with slow brood (third instars), but it is not certain whether colonies produce rapid as well as slow brood. Myrmica rubra has become a significant pest in areas in the northeastern U.S. primarily because these aggressive, stinging ants interfere with people's use and enjoyment of their properties, gardens and parks. Myrmica rubra's extremely high densities foraging both on herbaceous plants, shrubs and trees in combination with the cryptic nature of their nests, the probability of people and their pets inadvertently disrupting the ant's activities is very high. When disrupted, the ants will deliver a painful sting which has in a few cases produced severe allergic reactions to the venom including anaphylactic shock. Figure 5. 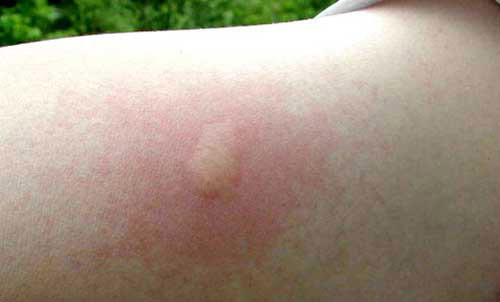 Symptoms of an individual sting by the European fire ant, Myrmica rubra Linnaeus. Photograph by E. Groden, University of Maine. In addition to its nuisance impact, Myrmica rubra is also having significant effects on natural ecosystems. Myrmica rubra appears to be responsible for the reduction of the ant diversity, richness, and abundance in infested areas, and has also exacerbated populations of plant feeding hemipteran pests such as aphids and scales. Figure 6. Worker ants of the European fire ant, Myrmica rubra Linnaeus, attending aphids and other homopterans in Maine. Photograph by F. Drummond, University of Maine. Mechanical control. One of the best means to reduce the impact of Myrmica rubra is to prevent its further spread. The public should be aware of the risk involved in transporting materials from infested areas. Potted plants, soil, mulches, and similar materials should be inspected on site and again before transplanting or use. Ant activity can be hard to detect if the colony is small and underground, so careful observation is necessary. If ants are found, it is necessary to avoid using the materials until they can be identified by a reliable source (entomologist, local Cooperative Extension Service office, or a university entomology identification program) and/or destroyed. Cultural control. Another tactic is to make the environment less hospitable for this ant. These ants prefer high humidity, moist soil, and reduced exposure to the sun (lightly shaded habitats). Reducing irrigation, mowing tall grasses and increasing sun exposure to the ground will decrease favorable nesting and foraging conditions for the ants. These ants build their nests under debris placed on the lawn, including rocks, boards, logs, and anything that maintains a moist environment underneath. Reducing nesting sites will reduce the populations and force the ants to nest elsewhere. This method will not eliminate Myrmica rubra, but may help to keep population densities low. Chemical control. If chemical control is necessary, the label of an insecticide labeled for ants should be followed precisely. Currently, the most effective materials to use are the food bait-based insecticides. Unfortunately, none of the insecticides screened by the Entomology program at the University of Maine have successfully eliminated these ant populations. Low concentrations (less than 1%) of boric acid mixed with a sugar attractant have been successful in the laboratory; however, results in the field have been inconsistent. Other control tactics are currently under evaluation. For more information about the management of European fire ants, or any other pestiferous ants in gardens, yards, landscapes, or parks, please contact the local Cooperative Extension Service Office. This Featured Creature publication is a cooperative effort between entomologists at the University of Maine and the University of Florida (UF). The senior author received his Ph.D. at UF in Fall 2006. The research he and his colleagues are doing on this species of ant is important as its potential range includes Florida. The authors thank Dr. Frank Drummond from the University of Maine for his constructive comments to an earlier version of this manuscript, and to the University of Maine's Ant Team for their collaboration with the project. Bolton B, Alpert G, Ward PS, Naskrecki P. 2006. Bolton's Catalogue of Ants of the World: 1758 - 2005. Harvard University Press, Cambridge, MA. Czechowski W, Radchenko A, Czechowska W. 2000. The Ants (Hymenoptera, Formicidae) of Poland. Warszawa, Poland. 200 p.
Elmes GW, Thomas JA, Wardlaw JC, Hochberg ME, Clarke RT, Simcox DJ. 1998. The ecology of Myrmica ants in relation to the conservation of Maculinea butterflies. Journal of Insect Conservation 2: 67-68. Elmes GW, Wardlaw JC, Nielsen MG, Kipyatkov VE, Lopatina EB, Radchenko AG, Barr B. 1999. Site latitude influences on the respiration rate, fat content and the ability of worker ants to rear larvae: A comparison of Myrmica rubra (Hymenoptera: Formicidae) populations over their European range. European Journal of Entomology 96: 117 - 123. Groden E, Drummond FA, Garnas J, Franceour A. 2005. Distribution of an invasive Ant, Myrmica rubra (Hymenoptera: Formicidae), in Maine. Journal of Economic Entomology 98: 1774- 1784. Wheeler WM. 1908. A European ant (Myrmica laevinodis) introduced into Massachusetts. Journal of Economic Entomology 1: 336-339. Publication Date: August 2007. Reviewed: February 2019.